Welcome, faithful readers (and those of you joining us for the first time) to the 120th installment of Cover Stories, the weekly column in which I, Jon B. Knutson, present a group of covers with a common theme! This week's theme is "Sports," and three out of the four, I'll tell you right now, are Superboy covers! 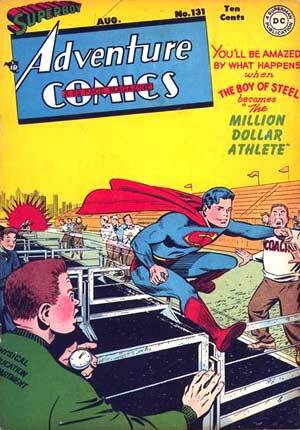 And here's the first one, Adventure Comics 131, with Superboy becoming "The Million Dollar Athlete." I'm not sure why the coach and others are so amazed at Superboy taking the hurdles all at once... don't they know the Boy of Steel can fly? This cover, taken from the splash page of the story, was probably by George Roussos and Ed Dobrotka. 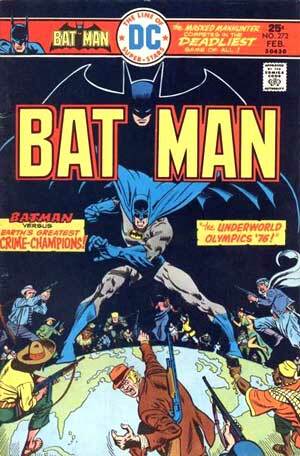 Inside, "The Million-Dollar Athlete" was probably written by Bill Finger, with art by Roussos. Also in this issue: Aquaman in "The Undersea Post Office" by Otto Binder and John Daly, Shining Knight in "Pirates of Plunder" by Joe Samachson and Chuck Winter, Green Arrow in "Targets for Tonight" with art by George Papp, and Johnny Quick in "A Crime a Minute" by Binder and Mort Meskin. Hmm... no gag fillers in this issue? Here's our next sports cover, Adventure Comics 143... okay, it's not really depicting any particular sport, but how often does one get a chance to share a comics cover featuring cheerleaders (at least, until there's a Heroes comic book featuring Claire Bennett on the cover, anyway)? I like those blue sweaters with the "s-shields" the cheerleaders are wearing.. too bad they don't seem to have ever produced a long-sleeved blue shirt with the shield, eh? This cover, by John Sikela and Ed Dobrotka, appears to have nothing to do with the Superboy story inside, "The Superboy Savings Bank" by Finger and Dobrotka. Also in this issue are Green Arrow in "The Arrow Raiders Strike" by Binder and George Papp, Shining Knight in "Villains Without Guns" written by Binder, Aquaman in "The Second Robinson Crusoe" by Binder and Daly, and Johnny Quick in "the Runaway Formula" by Binder and Charles Sultan. 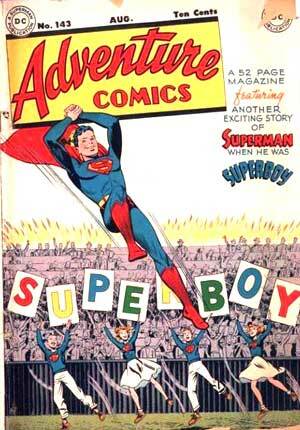 Well, Superboy's been a participant in sports, gotten cheered on... what's next for the Boy of Steel? 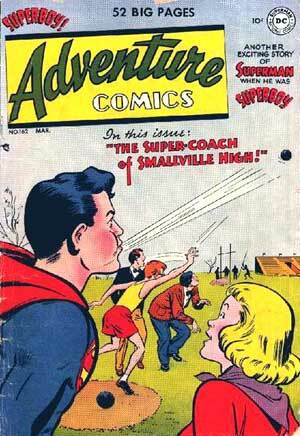 He becomes a coach, of course... and not just any coach, as you can see from the cover of Adventure 162... he's "The Super-Coach of Smallville High!" Although it seems to me by using his powers to help the Smallville High athletes compete, that's cheating, isn't it? Then again, maybe he's just doing that to help give them confidence, as he would later do as an adult for President Kennedy? This cover was by Win Mortimer. Inside, "The Super-Coach of Smallville High" was by William Woolfolk and John Sikela. Also in this issue were Johnny Quick in "The Slow and Easy Club" by Don Cameron and Ralph Mayo, Aquaman in "Under the Sea For Life" by George Kashdan and John Daly, and Green Arrow in "The Third Archer" with art by George Papp. Yes, it's Batman 272, featuring the Caped Crusader versus the Earth's greatest crime-champions in "The Underworld Olympics '76!" This was a fairly long multi-issue storyline, if I recall correctly, featuring pretty much what you'd expect from something called "The Underworld Olympics." This cover was by Jose Luis Garcia-Lopez. Inside, "The Underworld Olympics '76!" was by David Vern (writing as David V. Reed), Garcia-Lopez and Ernie Chan (as Ernie Chua). The story continues through Batman #275. Also in this issue is a Hostess advertisement, "The Cup Cake Caper" starring Captain Marvel, which is by E. Nelson Bridwell, Curt Swan, and Vince Colletta.